With the weekend coming up you might be having some guests in town or you may want to have a fun, tasty morning with the family. Hence, I would like to give you my favorite recipe of the moment. It is Nutella and Banana French Toast. For about two weeks, I ate it every day. So, if you are going to make it- proceed with caution. 1. Just break two eggs, 1/2 cup of milk, 2 tablespoons of brown sugar, 2 tablespoon of cinnamon, 1 tablespoon of vanilla extract and mix all these things up really well. 2. Take the slice of toast and quickly dip it into the mix once on each side so it is completely covered. Don’t leave it in there too long! 3. Take a stick of butter and rub it across a slightly warmed pan so the bottom is covered with butter and then put your slice of bread down. Sprinkle some brown sugar on the side facing up. 4. Leave it until that side becomes golden brown, then repeat for the other side. 5. Take this piece off and cover it with Nutella while putting another slice of bread on the pan. The Nutella will melt beautifully on the hot french toast. Once the other side is done just put it on top. 6. Cut the sandwich diagonally so it is four pieces. 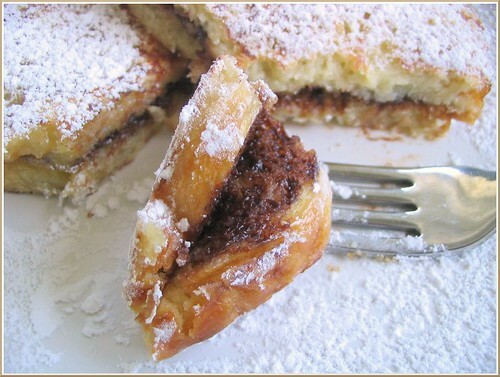 Sprinkle powdered sugar on top and cut bananas or whatever fruit you want on the middle of the top where the four corners meet. I was recently talking to a friend and noted that once something happens to you, it can ever un-happen. We can forget things, time can heal certain pains but there is no return to a place before it happened. We all have an it in our life. It can be a parent lost,a dysfunctional childhood, a tragedy, a great failure or a great regret. One minute life is at it was and then there is only life as it will always be from the moment it happened. This morning, I read this article about Haiti. I always feel the worst for the children. They have their whole lives in front of them. They will remember those bodies, these losses, and the pain of struggling to forget for the rest of their long lives. Some will be stronger for it. They will write about it in their admissions essays to Yale or Harvard. They will be applauded for their ability to overcome adversity but they will always feel like frauds. They will be haunted by the guilt of their success and they will always walk with the ghost of this event behind them. Others will not be so lucky. They will be forgotten when the initial outpouring of international attention fades away. They will grow up in orphanages, on the streets and in the homes of relatives who are struggling to feed the mouths they are already responsible for. Their aunts and uncles will see their lost brothers and sisters in these children. Over time, the world will forget about them entirely, but they will be left with the great curse of never being able to forget. There is a story in many traditions in which a man spreads vicious gossip about a leader in the community. Repentant, he goes to the leader and begs for forgiveness for all the hardship that has befallen the leader and says he will do anything to right his wrong. The leader tells him to go home, take a feather pillow and slice it with a knife so the feathers are carried away by the wind. Although he finds the request strange, the man complies and returns to the leader the next day to convey the news. The leader then tells him to go back and collect all the feathers and return them to the pillow. He tells the man that just as he will never be able to collect all the feathers, he can never right his wrong whose consequences can never be measured. In this situation, our inaction can be the it for many people’s lives. If we are in a position to send money, then we should send money. If we are able to travel there and hep with our skill sets, then we should travel there and help. If we have the capacity to adopt one of these children, then we should welcome them into our homes. I was feeling a little blah today and decided to google hope to see what would come up. I didn’t like any of the web results or the news stories that came up so I went to the images tab. The picture that caught my eye was the one above. When I clicked on the image, it led to a blog post and then a chain of comments. Many of the people there said that they had googled “hope” because they were down and seeing this simple message lifted them. It is such a small connection to the world. That someone else took the same step and was inspired by the same words. I was recently reading an article about the quarter life crisis and in it the author discusses how our generation was raised to believe that we are all special and unique. We are like snowflakes and there is no one in the world like us. It’s an interesting message because where it is supposed to inspire the person who receives it, instead it leaves that person feeling void and alone. Either the person believes it and then is convinced that they can’t relate to anyone else because she is so different or the person doesn’t believe it and feels inadequate for being just like everyone else. Last night I was watching Revolutionary Road for the second time and in it Kate Winslet’s character laments that they are just like everyone else. That there is nothing special about them at all. This realization is crushing and leads in many ways to the movie’s tragic end. What is so bad about being just like everyone else? What will we achieve by being different and unique? Is there any self that we’re supposed to find amiss the different messages we receive? I don’t know the answers to any of these questions and quite frankly I don’t even know if it matters. 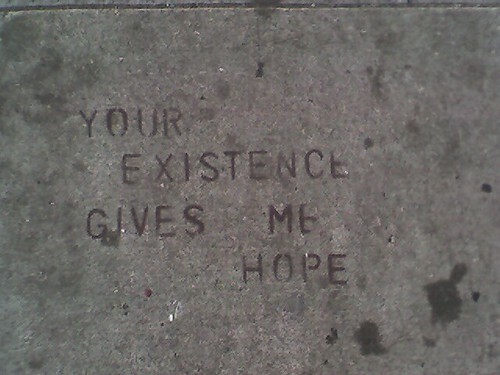 I just know that when I googled hope and found that someone else had felt just like I did and it led them down the same small path, it made me feel happy, it made me want to write about it. In the world of the internet, where disconnectedness and alienation seem to be the rule of the day, it was reassuring to find that there are exceptions to the rule. I have become a bad blogger. Inconsistent at posting and not really offering much of interest. It’s time to turn that ship around! One of the main reasons I want to continue blogging is because it is supposed to be good for someone who wants to be a writer to write consistently. Practice, practice, practice. Most days I want to write about something in the blog but I think it is too stupid of a matter to discuss online or I can’t be bothered to properly articulate my thoughts on an issue. So, I suppose it is some sort of fear that prevents me from coming to this website and just putting something down. In an effort to kick this fear in the face and to become more disciplined about writing I will now be posting Monday, Wednesday and Friday. I can’t promise anything earth-shattering or particularly exciting but I hope you will come visit anyway. Today, I will write about snow. When my cousins and aunts moved from Pakistan to America the snow was one of the things that struck them the most about Michigan. My one aunt would stand at the window and watch it endlessly. She loved it. She loved it’s cold, it’s white, it’s magic. I thought she was crazy. Maybe at some point in 1988 when we moved to America, I may have felt that wonder. The complete awe that accompanies watching the world as it is hidden under a big white blanket. The inspiration that comes from watching flakes of snow under a lamp post somewhere. The exhilaration of picking up the fluff and packing it tight as you can and hurling it at your best friend while trying to wrestle away from someone who is shoving a handful of snow down your back. But 20 years later in 2008, I hated snow. My friend’s used to always tease me about my illogical fear of snow. As soon as it would start to fall, all I would want to do is lock the door of my apartment and hide behind a massive thermos of tea until the first blossoms of spring would show themselves. It was that awful snow that caused my car to skid all over the roads, that made other cars susceptible to come flying at me, that convinced me that death was the passenger each time I got in the car. It was knee-high snow that I trudged through to get to class, it would creep into my boots, my pants and my mittens. It would surely give me pneumonia and lead to a slow, painful death in some anonymous hospital, on some anonymous bed. My mom’s phone calls didn’t help. As soon as the first flurries would start to fall, my phone would begin to ring. Snow. Stupid, dumb snow. Cold, freezing snow. Pain in the but, piling up all over your car snow. 2010. It’s been almost one year since I’ve seen snow. This week there were flurries and I was jumping around like a kid on Eid. Our office is one huge glass cylinder so when it snows it feels like you are in a massive snow globe. I have been so homesick for what was the bain of my existence. It reminds me of all those Michigan winters. When it would snow and snow until you thought even your house would get buried. And suddenly, everyone would be forced to slow down. They would see their neighbors as they struggled to keep their driveways clear and the sidewalks ice free. I remember going around Ann Arbor and helping people push their cars when they got stuck. Somehow, it brought us all together. How I wish we would get covered in it. To see all the Musjids and the Bosphorus through that magical lens of my youth and my old home. It would be something I would never forget. Word around the office is that we’re going to get sleet tomorrow and snow on Sunday. I never thought I’d be so happy to hear that forecast for the weekend! It is the first day back from the holiday. About half of the office is ex-pats so there was a mass exodus a few days before Christmas. Today, most people are making the big return. The moment you walk into the office you start to hear the Happy New Years! Everyone is smiling and refreshed. They are exchanging stories of how the powder was wherever it was that they went skiing, how they miss the sun from their vacation or making jokes about relatives they are happy they won’t have to see for another year. So, early in the morning, with chocolate already in my belly and still hearing stories and the chorus of Happy New Year all around me, I am grateful for this first day back, this job that I love and this city that is full of romance and mystery. Happy New Years to all of you. I hope that 2010 shames every year that has come before it!